The early morning overhead migration continues with counts of 250 siskin, 100 goldfinch, 50 linnet, 2 tree pipit, 2 grey wagtail and 2 yellow wagtail flying east. Grounded migrants included 50 chiffchaff, 14 goldcrest, 7 blackcap, a whitethroat and a lesser whitethroat. 3 eider were close inshore at Rock-a-nore. Reported by Alan Parker and Tim Inskipp on wildhastings. Photo by Mali Halls. Early morning overhead migration produced counts of 580 siskin, 400 swallow, 300 meadow pipit, 150 goldfinch, 5 tree pipits and a yellow wagtail east. There was an obvious fall of goldcrests with 50 counted. Other grounded migrants included a redwing at Ecclesbourne Meadow and grasshopper warbler at Warren Glen. Also 4 raven reported. During late morning and early afternoon a count of 16 common buzzards was made using cliff generated thermals and moving east. Reported by Alan Parker, Andrew grace and Tim Inskipp on wildhastings. Records reported for Thursday include an arrival of 7 song thrush and 6 redwing in the North’s Seat/Picnic Site area. Also 12 chiffchaff there and a passage of 54 meadow pipit, and single tree pipit, grey wagtail and pied wagtail overhead. Also overhead migration of skylark and chaffinch noted in small numbers over coastguard fields area of Hastings Country Park Nature Reserve. Also redstart seen near Warren Cottage on Wednesday. Reported by Andrew Grace on wildhastings. Overhead visible migration was dominated by siskin (450 east), meadow pipit (250), house martin (200) and swallow (100). Smaller numbers of other species were also recorded including 20 pied wagtail, 15 yellow wagtail, 5 grey wagtail, 3 tree pipits, 20 goldfinch, and 10 reed bunting. Migrant raptors reported included a common buzzard and sparrowhawk. Notable records of grounded migrants included the second record of Cetti’s warbler for the site in Warren Glen, 5 crossbill in the Barn Pond area, two redstarts (Fairlight Road Picnic Site & Rocklands Lane) and a spotted flycatcher at Fairlight Road Picnic Site. 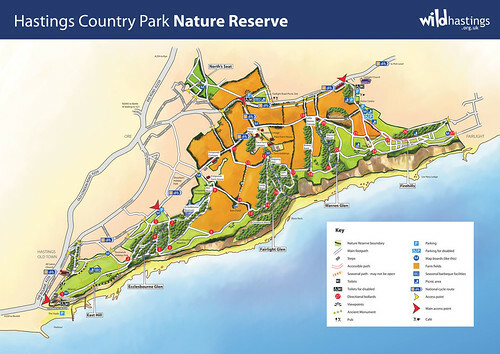 For a map showing official places names within the nature reserve click here or on the map below. After a few hours watching diurnal migration over the Firehills & Warren Glen, we were just leaving the Warren Cottage area at 11.00 when a Cetti’s Warbler rattled from the scrub! Not at all the kind of place I’d expect to see one; they’re more at home in swampy bits of the marsh. This bird obviously didn’t feel at home either, because it was quite easy to see in an Elder bush as it moved about calling anxiously before flying across the path into the dark interior of a Hawthorn. I’m not sure whether this species has been recorded before in the Country Park. 15 minutes before, as the air warmed up, a Common Buzzard and a Sparrowhawk had risen up over the crest by the church. There was some raptor movement visible over Warren Glen late morning with two marsh harrier and a hobby flying west. Seven sparrowhawk were counted either coasting along the cliff-top or soaring over the farm fields. Two peregrine also flew west low over Rock-a-nore Beach in the afternoon, probably local birds flying into town to hunt. A few hundred hirundines, mainly house martin, were feeding over the farm fields and a flock of 30 yellow wagtail and 50 meadow pipit gathered feeding around the Highland cattle in the Coastguard fields. Hirundines were also on the move flying west as well as a few siskin, yellow wagtail, meadow pipit and goldfinch. A few chiffchaff, willow warbler, blackcap and garden warbler were present around Warren Glen late morning/early afternoon but a lot more migrants were present early morning as the ringers had a record morning in the quarry with good numbers of chiffchaff and willow warbler ringed and an unusually large number of house martin caught and ringed in the arable margin nets. 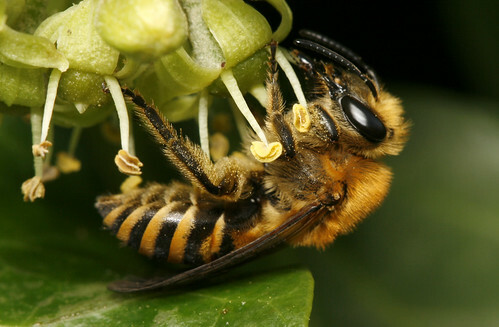 The ivy is in flower along Barley Lane and was attracting large numbers of the ivy bee, Colletes hederae. This recent colonist nests in huge colonies at Castle Rocks and on the HCPNR cliffs. The species is moving further east each year so it’s worth looking for the species at Cliff End. It’s an impressive bee, females being honey bee sized, with it’s rich brown thorax and pale brown ‘painted’ stripes on the abdomen. It specialises on collecting ivy pollen and times it’s nesting activity during September and October while ivy is in flower. A goat moth caterpillar was reported (with photo) from Firehills, Hastings Country Park NR on 21 August. Originally posted on wildhastings. 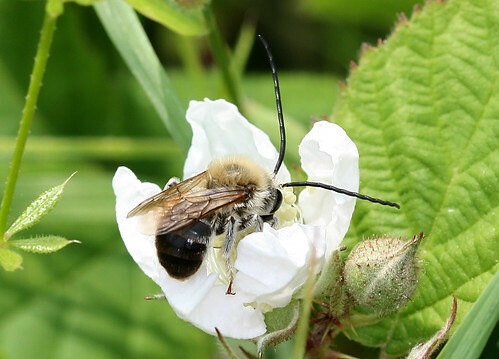 Andrena thoracica is one of the most impressive species of solitary bee in the UK. It’s large with bright foxy red hairs on the thorax and a polished black abdomen. The hind legs of an actively foraging female are also usually covered in bright yellow pollen as in the specimen in these photos taken at Glyne Gap recently. The pollen is probably a mix of many species as this species is widely polylectic. Unfortunately this species has been lost from many of it’s inland heathland sites, but is still doing ok along the coasts of Wales, Cornwall, Devon and Dorset. In the south-east the species is quite restricted and in the RX area is more or less confined to the cliffs of Hastings Country Park Nature Reserve, Glyne Gap and Castle Hill were it nests in sandy vertical banks. The males are usually seen patrolling these banks at high speed. The sandstone & clay cliffs, flowery undercliff, cliff-top heathland, semi-natural grassland and scrubby woodland edge of Hastings Country Park Nature Reserve are outstanding for Hymenoptera Aculeata, a group of insects that includes the bees, ants and wasps. The sandy ground and legume rich grasslands of the nature reserve produce an abundance of nesting habitat and a rich pollen and nectar resource for these insects. 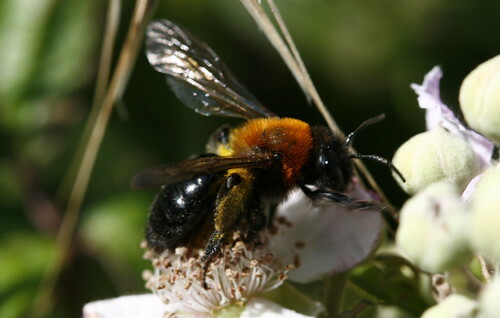 So far 204 species of aculeate have been recorded for the nature reserve and a checklist of the Hymenoptera Aculeata has been produced that lists all the species so far recorded. The checklist is a taxonomic checklist listing species according to currently accepted phylogenetic relationships and lists all the superfamilies, families, subfamilies, genera, subgenera and species recorded within Hastings Country Park Nature Reserve. Synonyms are also listed so this list can be compared with older lists produced for the Hastings area. Currently on the wing at the moment is one of the most charismatic of British bees the long-horned bee, Eucera longicornis. This is a nationally scarce species and a priority species for conservation in the UK. The females nest in clay banks on the undercliff and specialise in collecting pollen from members of the pea family such as bird’s-foot trefoil, kidney vetch, meadow vetchling and grass vetchling. The males with their very long antennae are a conspicious feature along the undercliff defending territory and nectaring from bramble flowers. More pictures of aculeates in Hastings here. The highlight from a visit to Warren Glen yesterday was finding this rather worn, but still attractive, Green Hairstreak during one of the brief sunny spells in a grassy clearing near the old quarry. This distinctive little butterfly is the only British species with truly green coloration.